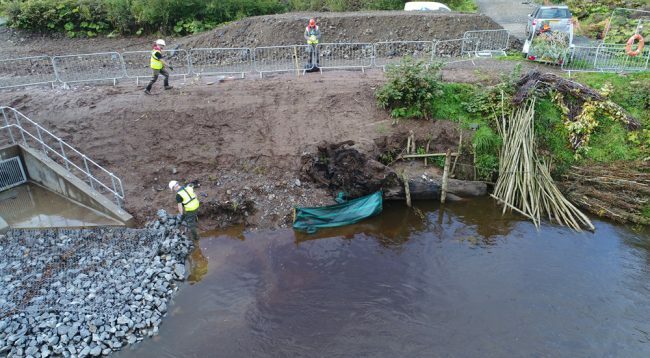 It was exactly one year ago that we were asked to install willow at Tarholm Sewage Outfall following completion of the new structure. This rather unpopular outfall had been installed after it was relocated from the Water of Coyle where there was inadequate dilution for the treated discharge from the Joppa treatment works. 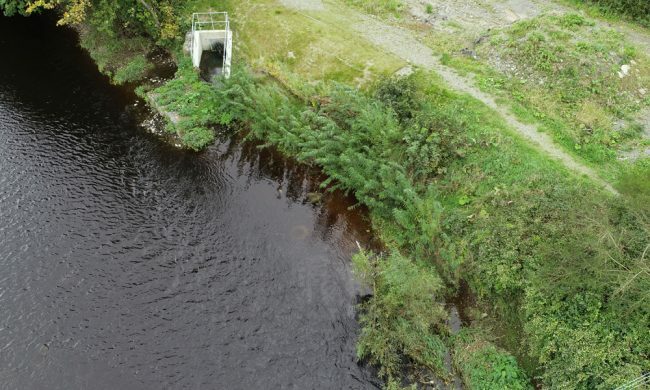 SEPA advised Scottish Water that a hard engineering approach was unsuitable so the decision was taken to look for a suitable green engineering option and that’s where ART were able to help. 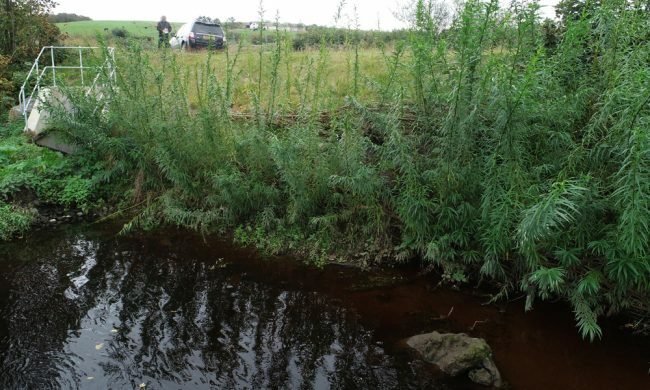 Given a tight deadline of the end of September last year, we quickly secured adequate willow from local sources and set about the constructing in the last week of the month. From a bare site, we transformed it into a terraced site using willow stakes and spiling and incorporated a large tree stump that was already on site. 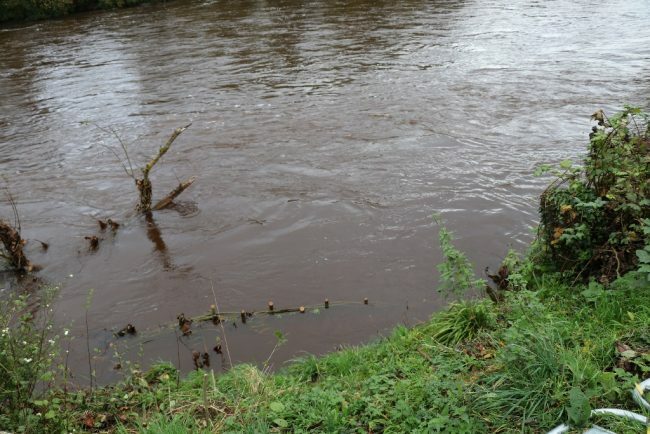 We completed by the end of the month and have watched as it developed since then and it has coped with all the river and weather has thrown at it. Winter floods drowned the lower terrace for several weeks over winter and then the drought of the summer set back plants developing on the upper terrace but they have survived and should catch up next year now their roots are developed. We’ve already taken cuttings from the site to use elsewhere and they have already rooted. Willow is such a versatile material and quick growing too. Once you have a few areas installed it will provide further material for other projects, year after year. As the year progressed, we revisited the site frequently and were impressed by how much silt it trapped from the river. Fine sediment in the water column is a problem for the Ayr and this technique can effectively reduce sediment transport with the added benefit of building banks. 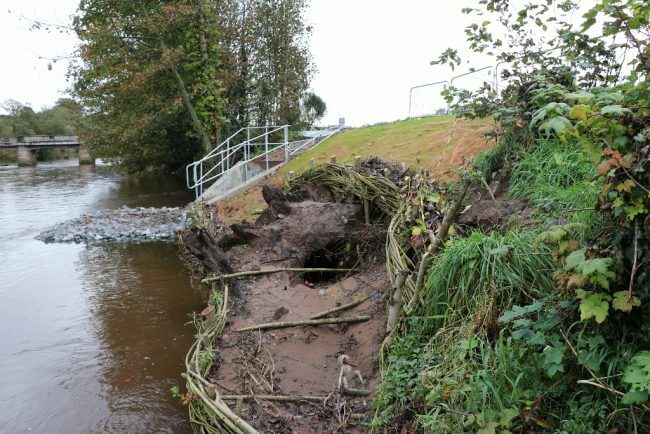 Over 30cm of sediment has been deposited behind parts of the structure in the first season. We revisited this site at the weekend, one year after completion and the results are impressive. Compare the before and after images in this post and judge for yourself. 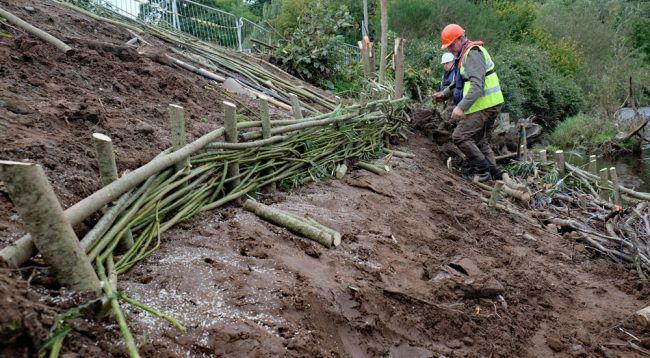 Anywhere erosion occurs, willow techniques may be used to solve the problems. There are many varieties of willow available across Ayrshire and some are more useful than others but ART are happy to provide advice and guidance to anyone interested.